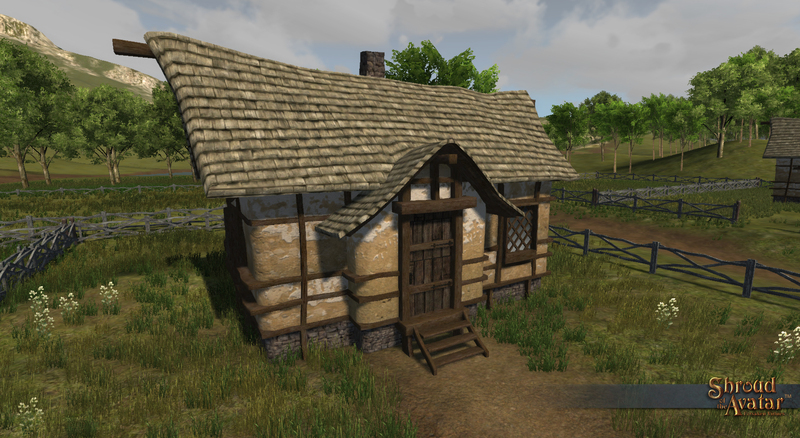 Update of the Avatar #40 – 09/20/13: Decorating Demo Video, Edelmann Home, Tower Homes, & Unity Scene Jam! We continue our Parade of Homes with this edition of Update of the Avatar, showcasing the Founder Edelmann Village Home, as well as the Tower Village Home and Tower Town Home! We also included a video demonstrating our home decorating system, plus a few other tidbits and goodies! For many of us, home decorating is central to our role-playing experience. It affords us the opportunity for self-expression, a display of status, showcasing the spoils of our adventures, or advertising our craft. The home decorating system in SotA continues to evolve both in power and ease of use. Mere words cannot do it justice, so Rick Holtrop choreographed this video demonstrating the latest progress in our home decorating system, narrated by Lord British. Enjoy! As Starr Long explains in a recent MMORPG.com article, Crowdsourcing the World, we purchase assets from the Unity Asset Store, many of which we can use as is, but some we want to change up a bit. We have made it a policy to offer the modified versions back to the original creators for free which they can re-sell as their own. We’ll showcase the Benefactor Edelmann Village Home in an future update. It will be similar in scale to the Founder Edelmann Village Home, with variations in layout and external appearance. and “Benefactors” are backers that pledged after May 20, 2013. Get Your Tower Home Now and SAVE 50%! For a limited time we’re offering a 50% discount on the Tower Homes! The Tower Village is available for $50 (regular $100) and the Tower Town is available for $75 (regular $150)! Reserve your Tower Home at the Add-On Store! 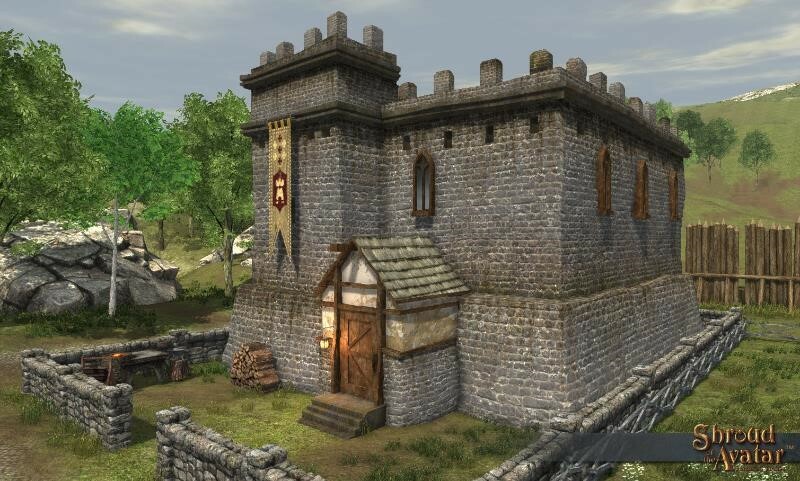 • You will need a Village, Town, or City Level Property to place the Tower Village home in-game, and a Town or City Level Property to place the Tower Town home in-game. • Citizen Level pledges and higher will still receive the home included in their rewards if they purchase the Tower Home as an add-on. 48-Hour Unity Scene Jam Starts Today! Interested? We thought you might be! 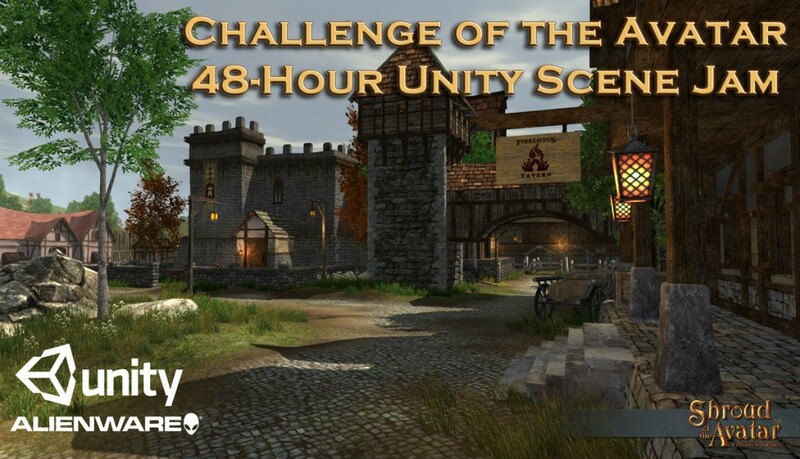 For all the details, head on over to the 48-Hour Scene Creation Challenge of the Avatar contest page! Better hurry, because the contest starts today, September 20th at 6PM CST (UTC-6)! Tracy & Laura Hickman’s Sojourner Tales Kickstarter Campaign Reaches Funding Goal! Congratulations to Tracy & Laura Hickman for reaching their $26,000 Kickstarter funding goal for their awesome board game! Sojourner Tales is a story based strategy game where players will have to use their wits as they discover and collect the pieces of a mysterious puzzle and try to be the first to complete the epic adventure. And because of the innovative Ebook Story Modules and adaptable design, the tale is different every time you play! So if you love great board games like we do, be sure to check out the Hickman’s Kickstarter page and help them reach their stretch goals before funding closes on Oct 10, 2013. • Includes Shingle-Roof home (shown were), but at 20 x 30 meters will accommodate the spacious Knight Village Home and Viking Village Home! • A two-story dwelling, with a single large room downstairs and a wrap-around loft on the second floor! We just launched a new visual style for the website. We wanted a cleaner look than we had before but still felt in the world of Shroud which is why we chose the parchment over stone look you now see. More improvements to the website will be coming over the next few weeks. Enjoy! 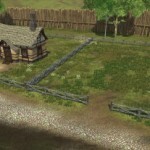 Update of the Avatar #39 – 09/13/13: Knight’s Home, Village Property Deeds, and the Unity Scene Jam! Welcome to another edition of Update of the Avatar! We know it’s only been a couple days since the last update, but we have some cool stuff to share and are too excited to wait! As a continuation of our Parade of Homes we initiated with the Village Home Edition in Update #37, we are showcasing the Founder Knight Village Home, as well as the availability of a limited quantity of Village Lot Property Deeds in the Add-On Store! 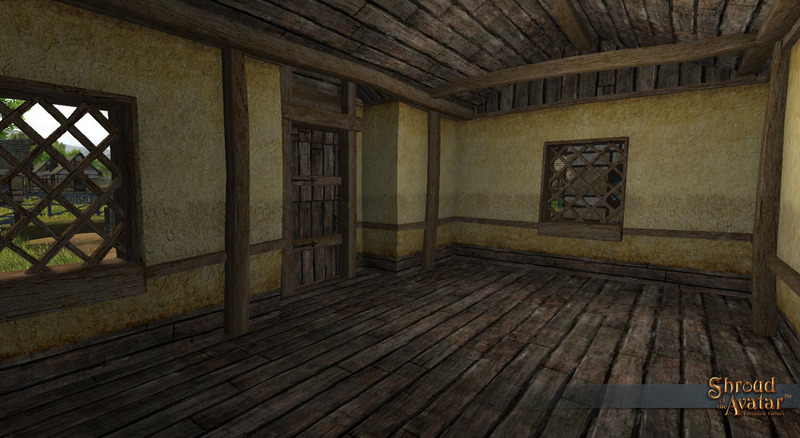 We also have the latest news about the Shroud of the Avatar Unity Scene Jam! Update of the Avatar #38 – 09/11/13: More Avatar Goodies, Edelmann House Poll, Tracy Hickman’s Sojourner Tales, & Changes to the Updates! More cool stuff to share with you this update, including Geoff Mellon’s revamping of the male avatar outfit, Bren Wilson putting some moves on the avatar attacks, the Edelmann House Poll, Tracy Hickman’s awesome Sojourner Tales Kickstarter campaign, and changes to how project updates are being shared. Update of the Avatar #37 – 09/04/13: Home Sweet Home! Greetings Fellow Avatars! Welcome to the Village Home Edition of Update of the Avatar! We’ve been working on several village-level homes, including the homes that are part of the Benefactor and Founder Citizen Pledge rewards. Please keep in mind that these homes are still “works-in-progress” and are being modified and tweaked as we receive feedback. So please, log in to our forums and let us know your opinions! Update of the Avatar – 08/14/13: The Making of a Female Avatar, The “Double Down on Community” Mission, the $10,000 Challenge of the Avatar, and More! We have several exciting topics to cover this update, including a behind-the-scenes look at the creation of our first female avatar, the female ranger concept art, the first Challenge of the Avatar (with over $10,000 in rewards), The Double Down on Community Mission, the new Recruit-a-Friend Reward Program, the Hearth of Britannia Telethon, and a survey for the clothing style you’d like to see in Shroud of the Avatar! So, let’s get started! The “Double Down on Community” Mission! We are eternally grateful to you, our amazing community, that have pledged so much support, and are contributing in so many direct ways to help us make this game great! Some have asked why we are continuing to do fundraising and why we are spending time on “special rewards”, wondering if this was delaying core game features. 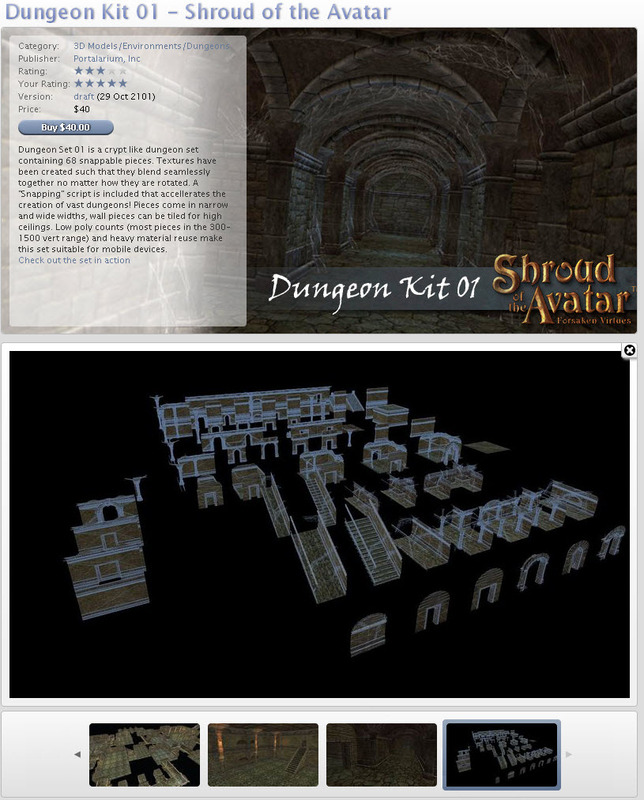 Update of the Avatar ~ 07/29/13: Build Your Own Dungeon with SotA’s Dungeon Kit Unity Assets! Greetings SotA Backers! We’re making history this month by being one of the first (if not the first) game developer/publishers to make game assets available to other developers for use in their own games, before the release of our own game! Traditionally, most big publishers would never allow the public release, or use, of game assets before, during, or after a game launches, for fear it would impact their sales or IP value. We believe just the opposite! We believe that by pre-releasing game assets for other creator/developers to use we will increase our own game’s success, while helping our fellow developers at the same time! “With Shroud of the Avatar, our team is breaking new ground in…the crowdsharing of assets to help build a powerful community! During the prototyping phases of SotA we found the Unity asset store immensely valuable. “Our goal is…the addition of monthly Unity asset packs that include a variety of SotA in-game art assets…to get professional game assets in the hands of our most ravenous fans and indie game developers…this gives them access to a stream of top quality fantasy content for their own creations. Dungeon Kit Available Now for Developer+ Backers! If you pledged at Developer level or higher ($400+), you can visit the Developer+ Depot to immediately download your Dungeon Kit. There is still time to upgrade your pledge to Developer+ and receive these FREE Asset kits which can be used in your own personal or professional Unity projects. There will be more kits coming, so it’s a great way to get your hands on some GREAT assets! We’re looking for dungeons that could potentially be used in some fashion in SotA, so we’d love to see the dungeons you create with our Dungeon Kit! 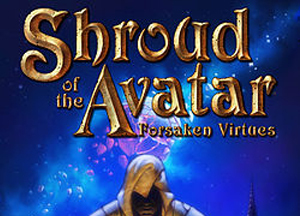 Here is the link where you can submit your work: http://www.surveygizmo.com/s3/1278170/Shroud-of-the-Avatar-Crowd-Sourcing. More Dungeon Kits Please! No, wait, more Characters & Creatures! Oh, and Houses too! 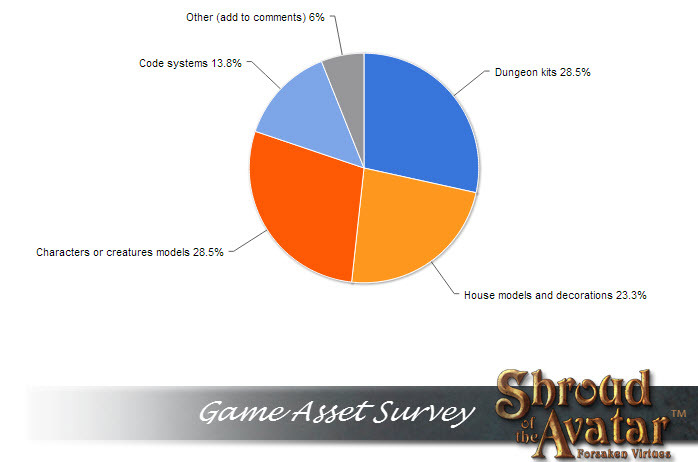 Over a hundred Dev+ Backers downloaded the Dungeon Kit in the first couple of days, which required them to complete a short survey. 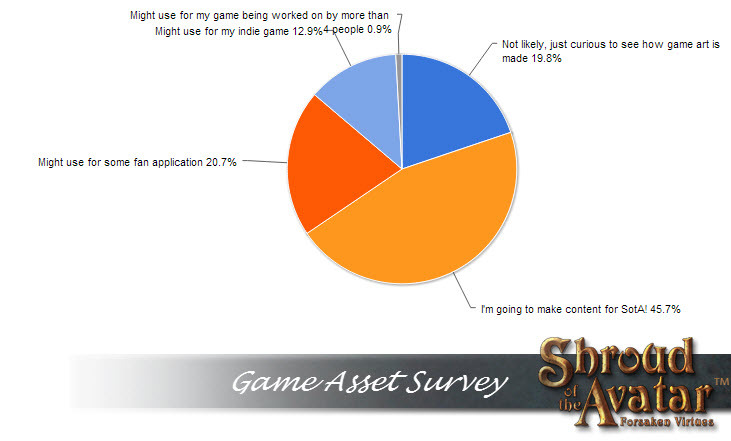 In answer to the question “How likely are you to use the assets?” a staggering 80% stated they plan to use the assets in some way, with 46% stating they wish to make content for SotA! Dungeon Kit Available Soon in the Unity Asset Store! Some of the game assets available to Dev+ Backers will also be made available to the general public in the Unity Asset Store. 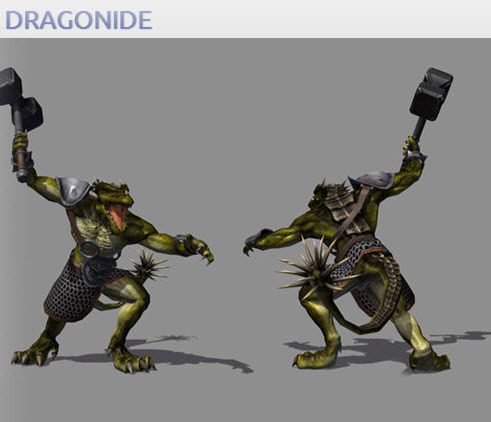 The Dungeon Kit has been submitted to the Unity Asset Store and is awaiting their approval. Look for it in the store sometime this week (Category “3D Models:Environments:Dunegons”)! 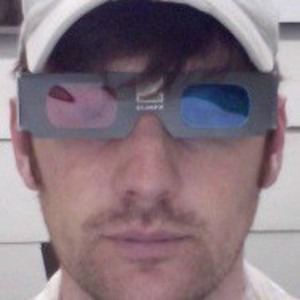 I’m a Unity Noob! How Do I Get Started? If you don’t already have Unity, you can download a free Windows version. Once you have Unity installed, Chris Spears recommends watching this Unity tutorial video, Part 1 and Part 2. There is also a great thread going on the Developer+ Forums where community members are providing more tips and tricks for using the SotA Dungeon Kit assets. Less Than Three Days Left To Get Your Darkstarr Moondial and Metronome! 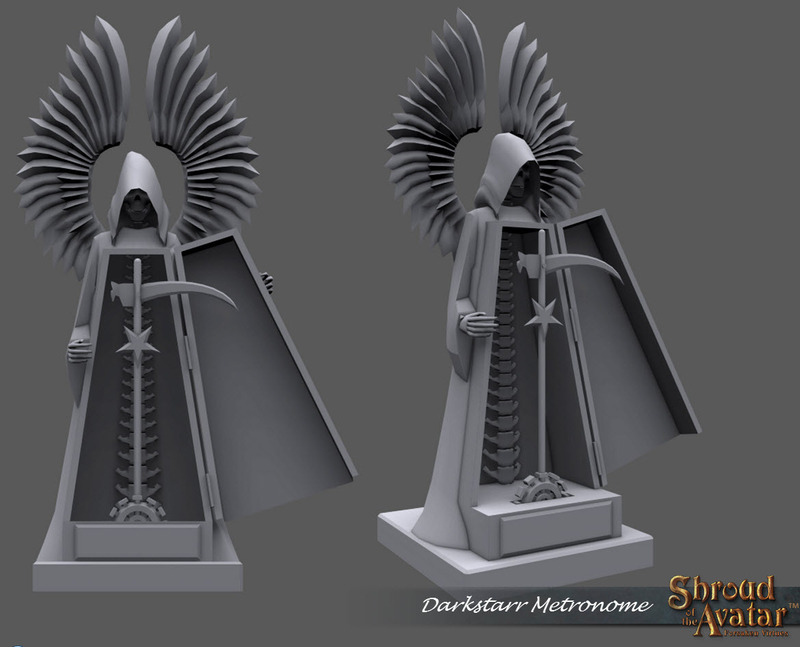 As reported in previous updates, we celebrated Starr Long joining the SotA team by memorializing his Darkstarr online persona with some cool, in-game stuff, most notably the Darkstarr Moondial and Darkstarr Metronome! These exclusive Darkstarr rewards are only available thru July 31st (less than 3 days)!. The Darkstarr Moondial is included in the Citizen Pledge Tier and the Darkstarr Metronome is included in the Virtual Collector Pledge Tier, only available to Backers who pledge any amount by July 31, 2013. These items are also available in the new Add-On Store until July 31, 2013. Checkout Update #34 for in-depth coverage of the inspiration, brainstorming, and collaboration that went into the crafting of the Darkstarr Moondial and Metronome. Show Us the Armor/Wardrobe You Want to See! Geoff Mellon, one of our character artists (known as Qball on the forums), is running a community collaboration event over on the forums, asking members to post images of the armor/wardrobe types they would like to see in the game. You will have until this Friday, August 2, to post your suggestions, then Richard “Lord British” Garriott will select all the pieces that will go into a survey for our community members to vote on. We will then create concepts inspired by the top 3 winners in each category. Please Register on SotA and Link Your Kickstarter Account! 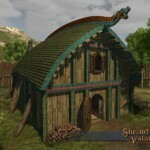 Stay on top of all the latest game development news by registering on our website, https://www.shroudoftheavatar.com. And if you have not already done so, please be sure to Link your Kickstarter Account, so we can ensure that you receive all of your backer rewards as soon as they are ready to roll out! Update of the Avatar ~ 7/23/13: The Making of a Moondial and Keeping the Beat! As reported in Update #32, in celebration of Starr Long joining the SotA Dev Team, we are memorializing his Darkstarr online persona with some cool, in-game stuff! This special update showcases some of those items! The Darkstarr Moondial is an in-game, home and yard decoration that will track the heavens both day and night! A very useful invention when planning strategies in-game, as this device lets you explore the mists of Revelations and Prophesy, unveiling astronomical events and revealing bits of lore to astute adventurers. 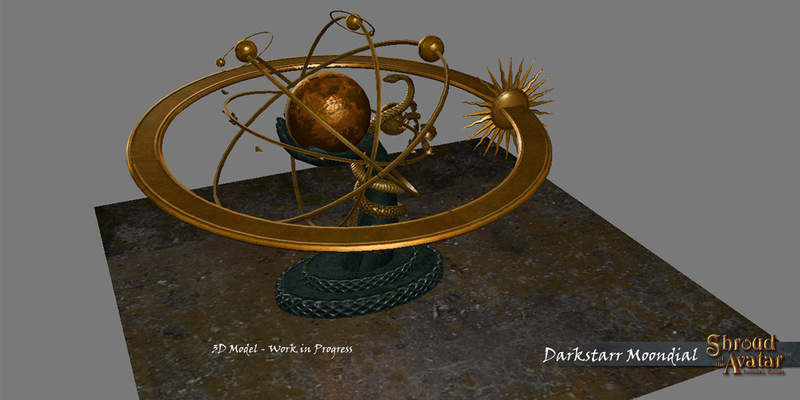 The Darkstarr Moondial is included as a reward at the Citizen level pledge. Our concept artist, Stephen Daniele (aka caravaggiosWolf on the forums), started a thread in the Community Announcements area of the Forums, tracking the work-in-progress of the moondial. It is a popular thread, already at 6 pages long and growing! Note: For the sake of brevity in the Demo, travel shortcuts were used to expedite our movement from area to area.﻿ Also, combat, lighting and SFX are still in a prototype stage and not fully implemented in this demonstration. 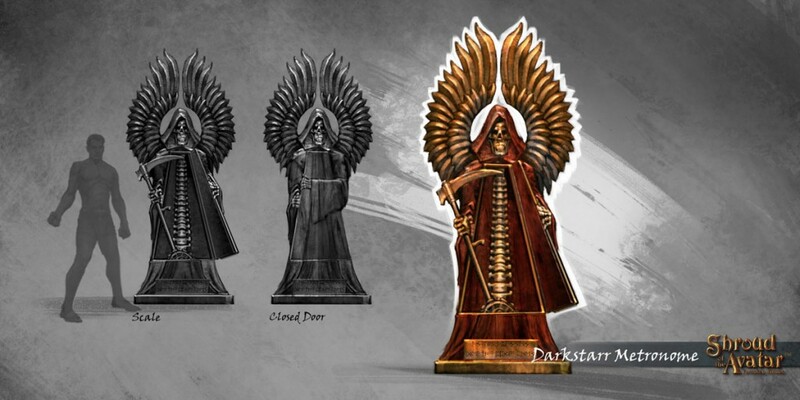 Update of the Avatar ~ Starr Long Joins Shroud of the Avatar Team, SotA Demo at RTX 2013 & Limited DarkStarr Rewards! AUSTIN, Texas, July 5, 2013 — The last time Starr Long and Richard Garriott teamed up to create a fantasy role playing game (RPG) was 1997. That game, Ultima Online, quickly became the first commercially successful massively multiplayer online role playing game (MMORPG) and many credit the duo with reinventing the RPG with that ground breaking product. 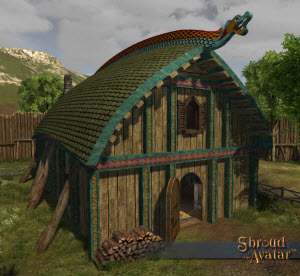 Now Garriott and Long are preparing for yet another collaboration to reinvent the genre, this time on Portalarium’s™ Shroud of the Avatar™ PC based game. Starr Long was announced today as the project’s executive producer.